pii2013: Building Trust in the Data Driven Economy—Hope to see you there! Mary and I will both be there as panelists and attendees. I am a panelist on “Emerging Technologies and the Fine Line Between Cool and Creepy.” (PatternBuilders is cool, competitors are creepy—just kidding!) Mary will be a panelist on “pii Post-PRISM: Trust & the Data-Driven Economy” and moderating a panel on “The Big Deal about Big Data: Predictive Analytics.” We are both looking forward to pii2013—it looks to be another great conference that gives Personal Identity Information the attention it deserves! 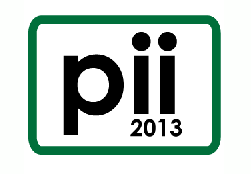 pii2013 will be held September 16 through the 18th. For those of you who would like more information on the conference go here. And for those of you who want to register for the conference, go here. Look forward to seeing you there! Entry filed under: big data, General Analytics. Tags: data privacy, data security, pii2013.